Paul Morgan is a young criminal always on the hunt for any easy score and a party. He’s brash, cocky and ballsy, and he drags his reluctant brother, Brian, in his wake. When Paul pushes a local hippy-gangster, Mad Mickey, a little too far, he does the sensible thing and flees Belfast, taking his brother with him. Their getaway vehicle though is Mickey’s van, which they then duly torch. 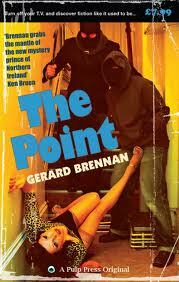 Settling into their new life in Warrenpoint, a small seaside town, Brian meets Rachel, a slightly psychotic lass who’s a keeper, and Paul inveigles his way into the local drug dealing scene. And whilst Brian gets a job in a lumber yard, Paul convinces the local kingpin that he can rob cars to order. All Brian wants to do is work and be with Rachel, but he can’t escape the Paul’s vortex of crime and self-destruction. And then there’s Mad Mickey, a man who loved his van. The Point is a novella. And whilst it’s a relatively short book - I flew through in a couple of hours - it packs one heck of a punch. The writing is tight, each scene crafted and shorn of flab, and the pace is electric and never lets up. What really struck me about The Point was that it managed to work at a number of different levels - it has crime and violence, warmth and tenderness, humour and pathos - and it had gritty realism to the anarchic arc of the Morgan brothers freewheeling lives. I believed in the characters and their relationships to each other, and the dialogue was spot on. Paul, Brian and Rachel are fully formed and come alive on the page. I would love to see this adapted into a movie or two hour TV show. If you want a gritty shot of Irish noir then order up this fine fare. This is so cool. Thanks, Rob! Really glad you enjoyed it. I agree. It is aabsolutely made for a movie. Sounds terrific. On my list. 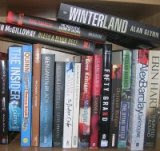 Love short books.